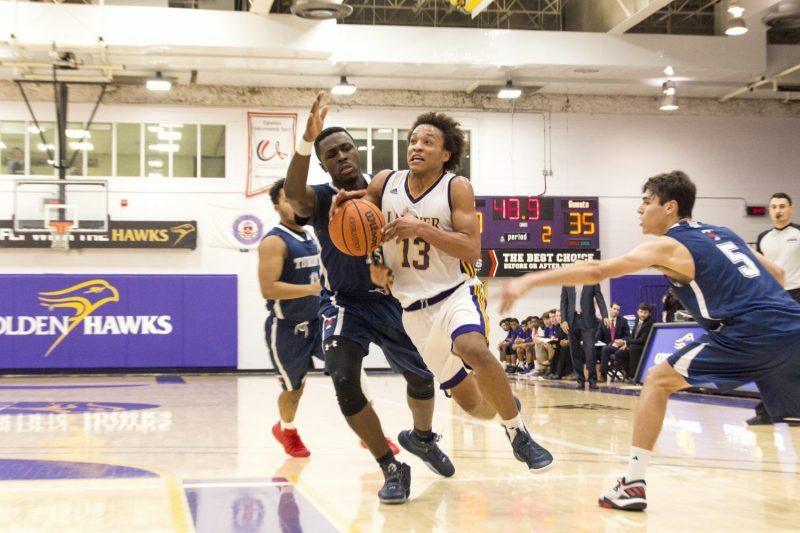 The Golden Hawks played host to the University of Toronto Varsity Blues on Saturday afternoon in hopes of getting back into the win column. For the Hawks, this game was all about containing the U of T offence as they are one of the top shooting teams in the OUA this season, lead by Devin Johnson. The Hawks came out flying within the first few minutes of the game as they were able to grab a quick 10-0 lead over the Varsity Blues, forcing a U of T timeout early. “I think [Laurier’s fast start] started with changing up our lineup to start the game, I’m not usually a big fan of it, to tell you the truth, but we needed a spark … Toronto is a great offensive team so we knew we had to shut them down for at least two quarters which we almost did,” said head coach Justin Serresse. The second quarter started out quickly as Tevaun Kokko and Johnson exchanged 3’s to open the quarter and keep Laurier lead at 6. Laurier extended their lead to 12 in the quarter, but the Varsity Blues battled back and kept this one close at 39-35 in favour of the Hawks, going into the half. The true star of this one was the Laurier offence lead by first-year rookie, Kokko. Kokko finished the first half with 15 points, seven rebounds and five assists including going four for nine in three-point shooting. “It’s all about his speed and his shooting ability. He’s so quick and he shoots the ball so well. If you can do that, you’re going to be very successful in this league,” Serresse said. Johnson lead the scoring for the Varsity Blues in the half as he rounded out the first half with eight points. The Varsity Blues came out to start the half on a mission — in the first minute of play, the Blues had taken a quick 40-39 lead. A very tight third quarter by both teams finished up with the Golden Hawks leading by a basket: 62-60. Johnson had a strong quarter putting up 11 points for the Varsity Blues. Laurier came out in the fourth quarter ready to shut the door and they did exactly that. The Hawks put up a game high of 29 points in the fourth quarter, which was good enough to secure the win. Laurier had a great day on both ends of the court, shooting 30 for 60 field goal percentage and holding the the Varsity Blues to just 24 for 71. The Laurier offence was once again lead by Kokko who managed to drop 29 points in the contest. “He’s a scorer. He’s always been a scorer and he’s very fluid. I try to help him as much as possible, but I also try not to over coach him because I don’t want him to lose his offensive flare,” Serresse added. However, it was Blues star Johnson who had the game high total, dropping an impressive 37 points for the visitors. Next up, Laurier will head down the road in hopes of avenging their Loss to the Waterloo Warriors from a week ago. “We were extremely selfish in that game, not just one guy, our whole team was being selfish, as if they were going to do it all by themselves, forgetting it’s a pretty good team out there and we need to do it together,” Serresse remarked.